(From left) Nestlé marketing and corporate communications manager Alfred J. Borg, Parliamentary Secretary Clifton Grima, founder and chairperson of LifeCycle Foundation Alan Curry and Shirley Cefai respectively. LifeCycle Challenge 2019 is going to be a 2,000km ride through Southeast Asia. It will take cyclists on a route starting in the city of Hanoi in Vietnam, going through Laos, Cambodia, re-entering Vietnam to end in Ho Chi Minh City in Vietnam. 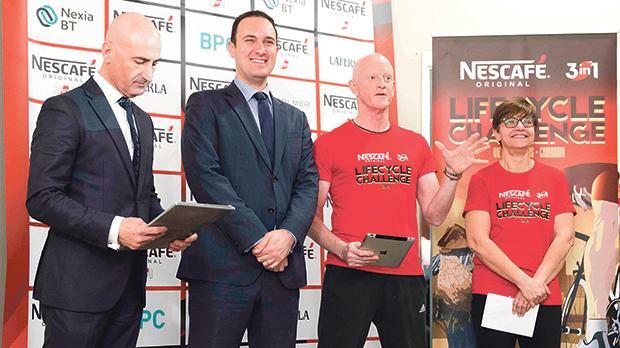 LifeCycle (Malta) Foundation also announced its new sponsorship deal with Nescafé 3in1 for the 21st and 22nd editions of LifeCycle Challenge. The two-year sponsorship of €70,000 will see Nescafé 3in1 as the title sponsor of the LifeCycle Challenge. Commenting on Nescafé’s 3in1 sponsorship, Alfred J. Borg Nestlé marketing and corporate communications manager said: “The partnership with the LifeCycle Challenge will further highlight Nestlé’s ongoing commitment in promoting a balanced and healthy lifestyle among its communities, and in this case in Malta. Furthermore, the respect and dignity the Lifecycle Foundation has sought from inception to instil into this cause is demonstrated by their effort to treat not merely the patients, but their relatives and the rest of the community through various initiatives aimed at educating and preventing. Training for Nescafé 3in1 LifeCycle Challenge 2019 has begun. Donations for this cause can be sent via sms: 5061 7370 = €2.33; 5061 8920 = €6.99; 5061 9229 = €11.65; or via a call to 5160 2020 = €10, 5170 2005 = €15; and 5180 2006 = €25. Bank details are Swift code VALLMTMT, IBAN number MT 18 VALL 22013000000014814521017, Bank name Bank of Valletta, Account number 14814521017. For further updates and to donate towards LifeCycle Challenge 2019 visit https://www.facebook.com/LifeCycleChallenge/.